Dubai. I’ve recently visited for the second time. The first time round, I spent a lot of time in a conference hall talking to the travel industry about travel blogging. My glimpses of the city were snatched from the air conditioned confines of taxis, and my impression was of a shiny land in the midst of a desert, offering a lot of style but not a great deal of substance. On my second visit, I discovered that that impression was wrong. Sure, Dubai is a shiny land in the middle of a desert. And yes, shopping is a major pastime. But scratch the surface, and you’ll find there’s more to the city than malls, shiny baubles and impossibly tall buildings. 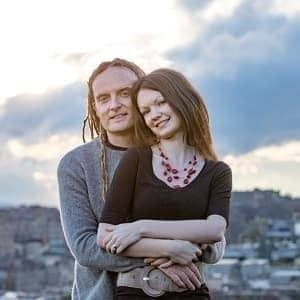 There’s enough here to keep you entertained, and the people who live here are worth investing some time getting to know as well. Ok, so I said that there’s more to Dubai than the shopping, but if you are into shopping, then this is going to be some kind of wonderland. Dubai is home to some of the largest and most impressive retail malls in the world, where you can buy pretty much anything your heart desires, and lots that it will suddenly think it desires. If you’re not into malls, then you should visit the souks. These are more traditional markets that have been in existence for a lot longer than their modern day air conditioned brethren, with each focusing on a specific product. Want spices? Head to the spice souk. Gold more your thing? 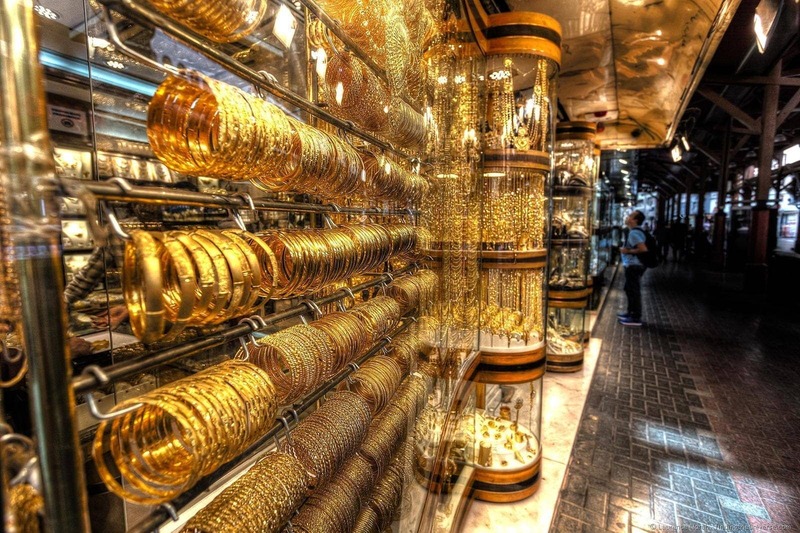 Head on down to the gold souk, where over ten tonnes of this shiny substance is for sale at any point. There’s also the covered souk, the textile souk and the fish souk, with the latter requiring a morning visit to see it in action. 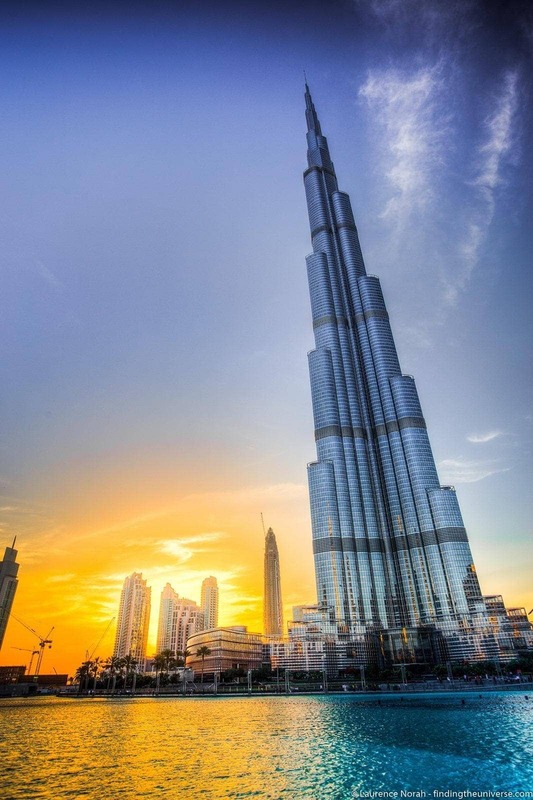 The Burj Khalifa, at time of writing, is the tallest man made structure in the world, and yes, it’s seriously impressive, particularly as none of the other buildings around it come close in height – the Burj soars above them all. It holds a whole number of records, from longest distance elevators (over half a kilometre! ), to being home to the world’s highest nightclub, restaurant and, of course, most floors, at 163. You can go up the Burj to the observation deck on the 124th floor, but if you’re pressed for time, then I’d recommend at least taking in the fountains at the bottom, which go off around dusk every day for a synchronised music and water display. Down at the southern end of the long geography that is Dubai is the Marina area. This is home to even more fantastical towers, as well as the, frankly bonkers, offshore island construction in the shape of a palm tree. It’s an expensive part of town for sure, but it’s very pretty, particularly at night. If you can get above it for a view of the skyline, I can recommend doing so. I’m not usually a big fan of museums, but I have to say the Dubai Museum is a fantastic way to quickly learn about the rapid changes that Dubai has undergone. 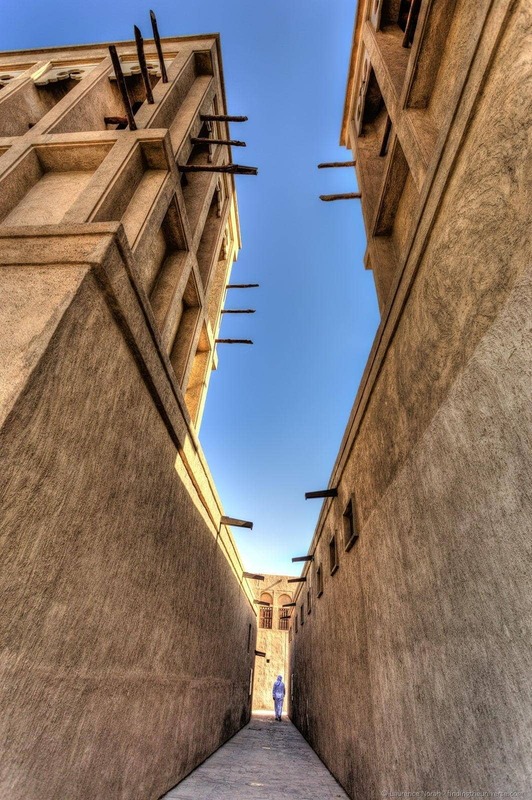 It’s housed in Dubai’s oldest building, the Al Fahidi Fort, which dates from 1787. By Dubai standards that’s seriously antique. The museum was opened in 1971, and in the intervening years Dubai has changed a great deal. In the museums underground section, you can learn all about those changes, with the history of the city laid out in diorama form, from small trading town through to the discovery of oil and on to the metropolis that you visit today. Entry is excellent value at around 3AED, so if you have a moment I’d certainly recommend this one. To further understand the history of Dubai, I’d also recommend a visit to the Dubai Heritage Village, also known as the Heritage & Diving Villages. The highlight of this, for me, was the Sheikh Saeed Al Maktoum house, where the former ruler of Dubai lived and ruled from. Now a museum, it shows fascinating photos from the Dubai of old, as well as giving a glimpse of what life was like in Dubai, and how it has changed over the past century. I would very much recommend hiring a guide for this tour though, as there aren’t many people around to offer advice or insight, and having someone explain why this place is so historically important will certainly help it make sense. 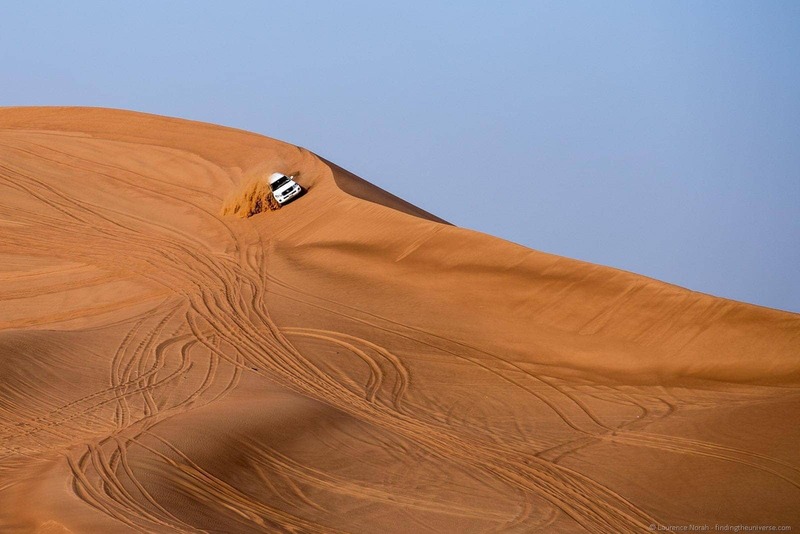 After my first trip to Dubai, I got a lot of feedback from you guys that I should have done some sort of desert safari experience. So this time round I did just that. This is a half day excursion out into the desert (obviously), where you get to do all kind of deserty things, from dinner under the stars through to camel riding. The highlight though has to be the dune bashing. This is where you get plopped into a hugely powerful off road vehicle (a Toyota Land Cruiser in my case), and zoomed around the dunes. Now, I’m a bit familiar with off road driving, having travelled around Australia in my very own Land Cruiser for a year, and I did a whole pile of off-road stuff. So I was prepared to be underwhelmed. This was a whole new world. The drivers here have to do a minimum of six months specialist training to drive these vehicles in the desert, and it shows. It was like being strapped in to a rally car and let loose across a desert. It was fast and exhilarating. I don’t think Fluffy would have liked it. Highly recommended. 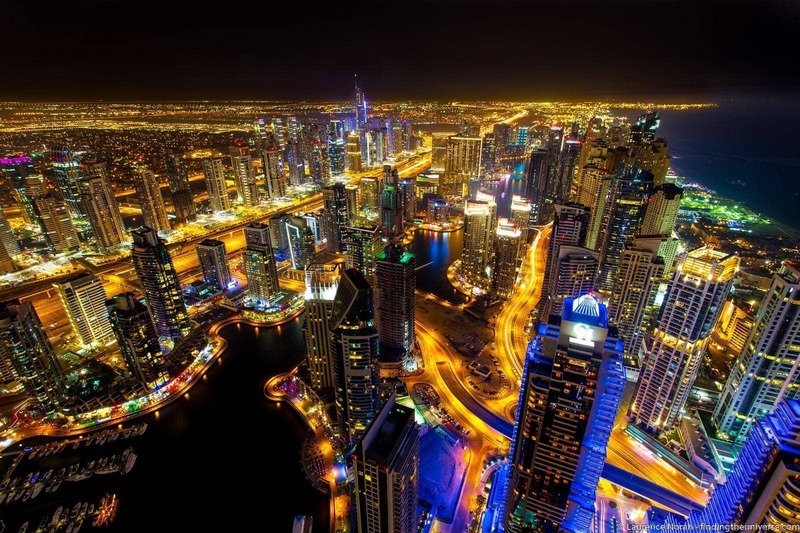 All the above aside, what really made Dubai so fascinating to me were the people who lived here. The weird thing is that of the roughly 2 million people who live here, only 10 – 15% are actually nationals – everyone else is an expat. And with representatives from pretty much every country you can imagine, there’s no shortage of interesting people to meet. 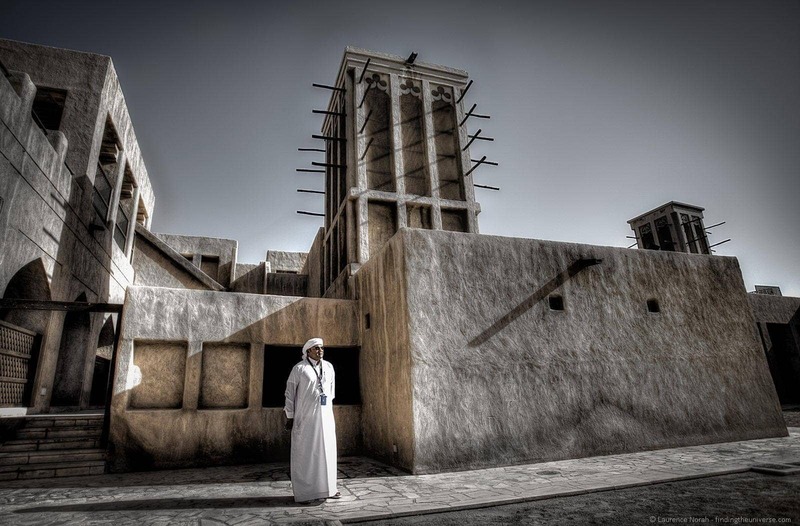 Take my guide around the older parts of Dubai for example, Ejaz, who is photographed above in the heritage village. From Pakistan, where his wife and family still live, Ejaz has been living in Dubai for ten years, with the majority of that time spent working in tourism. In my case, he was working for Multiline Holidays, who provided me with the city tour and dune bashing. He was genuinely enthusiastic about his work, knew pretty much everything about all the sights we visited, and when quizzed about his life in Dubai, was happy to explain why he loved living there – with factors like the low crime rate and cleanliness ranking highly, not to mention the employment opportunities. It’s worth mentioning of course that not all expats lives are a bed of roses. This was hinted at in conversations I had with various folk, and largely concerned the challenges facing those working in the construction sector. I spoke to the hotel I was working with about their approach to their staff, and was pleased to find out that they have a policy that their 460 staff (representing 40 nationalities!) are well looked after and treated ethically. They were certainly all very friendly! Finally, the two tours I took were provided via the hotel who have a partnership with Multiline Holidays. Their tour guides were fantastically knowledgeable, spoke excellent English, and were very friendly. If you choose to stay in the Rotana, then I’d certainly suggest hooking up with these guys for any tour requirements. And that’s it for my Dubai recommendations! Did I miss anything? Got any questions? Sound off in the comments below! 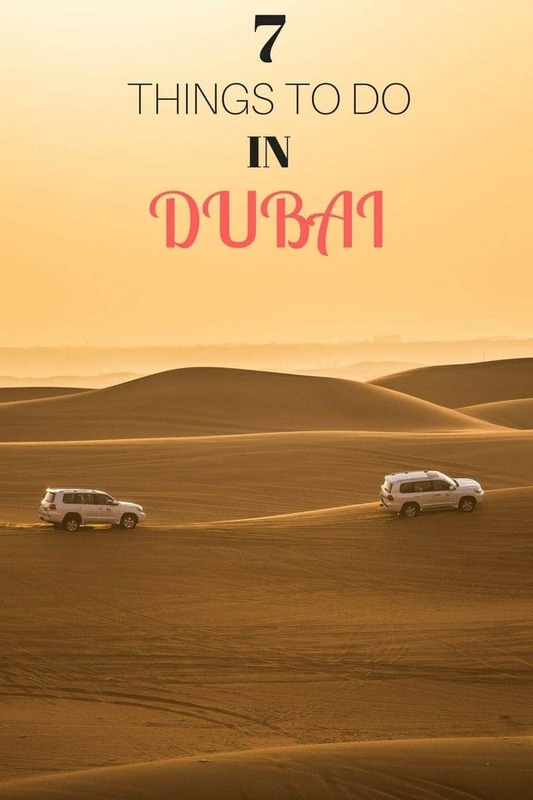 My trip to Dubai, accommodation and tours with Multiline were arranged and handled by the Al Ghurair Arjaan & Al Ghurair Rayhaan by Rotana Hotel in return for telling you guys about them. My opinions remain my own. Very nice post. I am about to go and visit Dubai (3 weeks left, yey). Great tips, thank you very much!!! My pleasure, have an awesome trip!